Baby Driver cruises through genre homage that feels surprisingly familiar. Edgar Wright loves his genre cinema—of this there can be no doubt. Since graduating from British episodic television to features in 2004, Wright has delivered affectionate takes on zombie horror (Shaun of the Dead), 1980s buddy-cop action (Hot Fuzz), comic-book adaptation (Scott Pilgrim vs. the World) and science-fiction (The World's End) with a distinctively oddball sense of humor. No matter what form he was fiddling with, he never seemed to be playing copycat. Call it satire, call it send-up, call it homage, but even when an Edgar Wright movie was nodding at other movies, it never felt like he was trying to make anything besides an Edgar Wright movie. 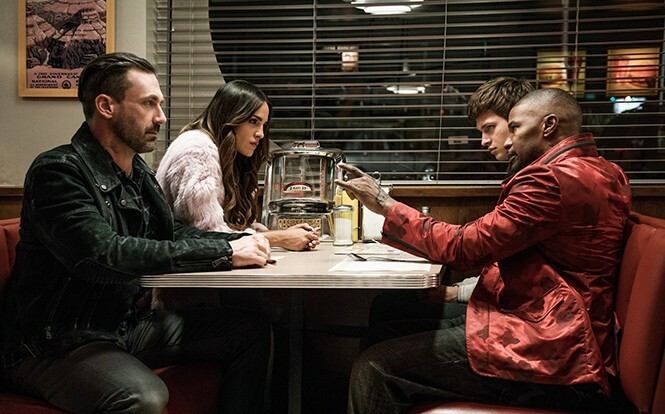 On the surface, Baby Driver seems to fall squarely within his wheelhouse of planting a sloppy wet kiss on an unapologetically low-brow cinematic form—in this case, the '70s exploitation heist thriller. But there's something off about the tone that makes it feel like he's filtering his vision through other approaches to similar subject matter. Instead of an Edgar Wright movie, it feels like a photocopy of a photocopy—an Edgar Wright version of a Quentin Tarantino take on the exploitation heist thriller. That's not the case for the opening 20 minutes, which offer a blissed-out and thoroughly distinctive shot of movie endorphins. While a trio of armed baddies (Jon Hamm, Eiza González and Jon Bernthal) rob an Atlanta bank, getaway driver Baby (Ansel Elgort) plugs his earbuds into a Jon Spencer Blues Explosion tune, rocks out and air-drums his way through the actual robbery, then lets his soundtrack guide him on a magnificently careening flight from the police through freeways and city streets. The next morning, as he fetches coffee for his cohorts before they split the take, Baby bops down the street to Bob & Earl's "Harlem Shuffle," with the lyrics appearing in graffiti, window signs and lamppost flyers as though the city itself had acquiesced to being part of his personal music video. It's a splendid, giddy-making introduction to the way this character lives in the world created through his music, even as chaos might be erupting around him. But the more we learn about Baby, the less interesting he becomes. The omnipresent music is a therapy for tinnitus that has lingered after the childhood car accident in which both of his parents died; his involvement as a getaway driver is part of paying off a debt to the theft ring's mastermind, Doc (Kevin Spacey), for the youthful mistake of having boosted Doc's stolen-goods-filled car. Wright (who also wrote the script) tries to build sympathy for Baby's desire to find some semblance of a normal life—especially once he falls for a diner waitress named Debora (Lily James)—and while Elgort serves up some nice moments as the introverted Baby, he fails to hold the center once he's moving less to his own enigmatic rhythms. There are plenty of interesting characters around the edges, but even then Wright keeps making awkward choices in how he uses them. Jamie Foxx gets a terrific part as an unpredictable new member of Doc's crew, and Hamm shows off a more dangerous side that hasn't previously been part of his repertoire. Yet you also get Spacey doing a version of "menacing Kevin Spacey character" that feels recycled, and a strangely misguided decision regarding who becomes Baby's ultimate antagonist. As many goofy bits of business as Wright manages to pack into Baby Driver—including a grade-school-age kid who's just a bit too familiar with how to scout a potential robbery location—there are also a number of elements that feel slightly ... off. Nothing is quite so askew, though, as the overall sense that Wright isn't even working from primary source material. Echoes of Tarantino are everywhere here, from the soundtrack lousy with vintage chestnuts (T. Rex, Golden Earring, Queen, Barry White) to the loquacious criminals to the abrupt bursts of violence. As the running time drifts toward two hours, much of the action starts to feel repetitive, as though Wright weren't quite sure how to find the soulful center that has anchored Tarantino's best films, and that Simon Pegg and Nick Frost were able to give to Wright's other celebrations of cheesy entertainment. It's a frustrating thing to find such a gifted filmmaker taking on an idea where he seems to be saying, "Somebody else already did this before, and better."